Bill Crumbleholme worked on a project with some students, investigating prehistoric pottery, during the autumn and winter of 2006. 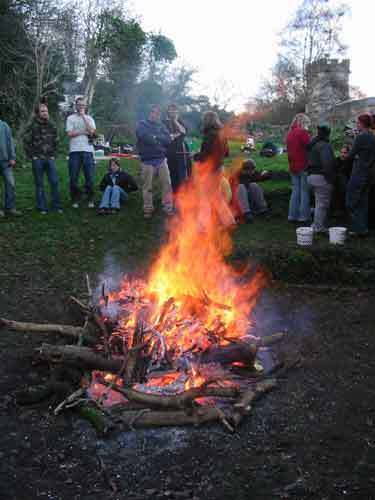 After the success, see below, further work was undertaken in late 2007 and 2008. 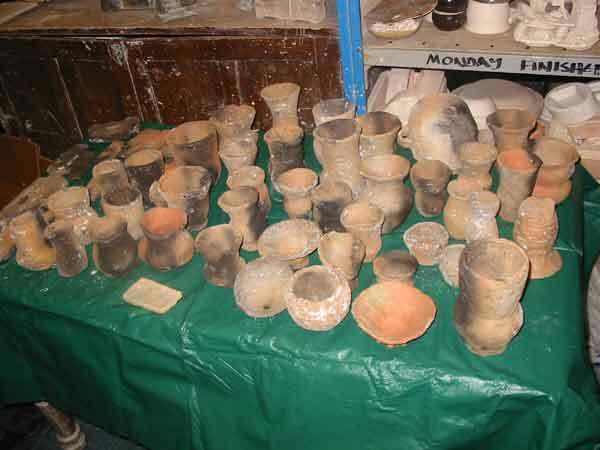 Clay was sourced from a riverside bank in Purbeck, the students refined it and prepared it and made some beakers. 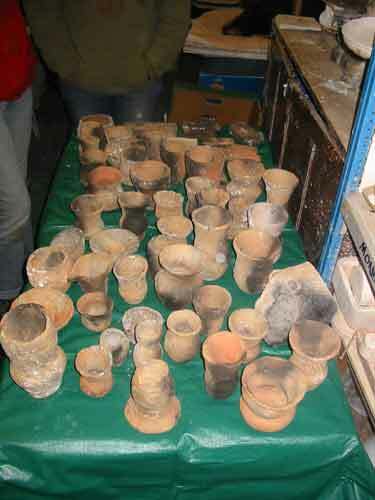 They also made a range of inclusions - crushing some of Bill's waster pottery from the seasons bonfires. 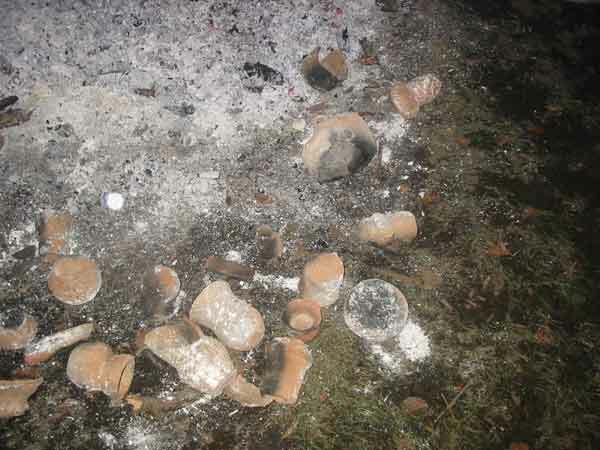 A visit to Upwey in early December 2006 featured a bonfire firing of their pottery and some tablets of various blends of clays and inclusions for analysis. 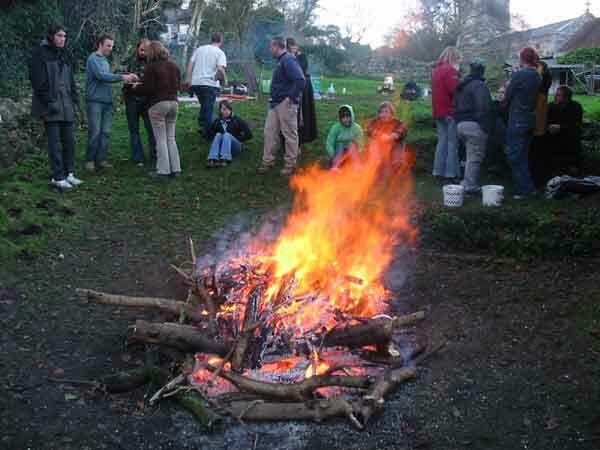 Below are some images of the day's activities, which also included Kate Verkooijen's demonstrations of Bronze age cooking and textiles. This site will feature a separate section on Kate and her efforts. 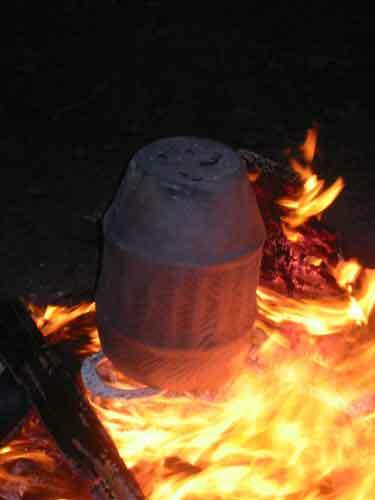 The pottery is just beginning to turn colour, after a couple of hours of preheating inside a ring of fire. So far no breakages! A little while later ... the first pot has spalled - the bottom blown away - obviously the one which took the most work to make (with handles and everything!) and was previously voted pot most likely to look really good. Maker Dan had dug his own clay, hence the lighter colour, maybe it was not quite dried out enough. 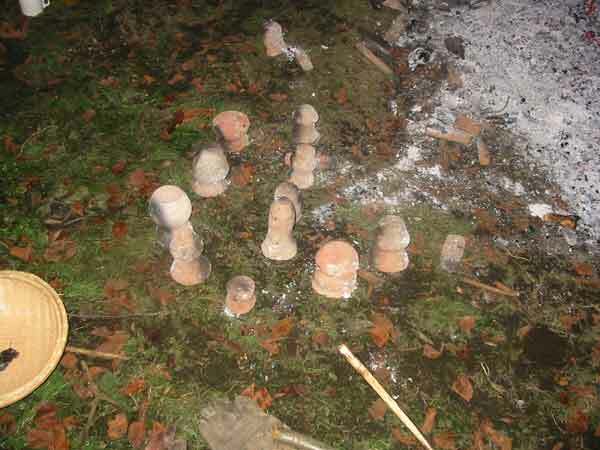 Said Dan covering over the pots, now all nicely pre-heated, creating a firing chamber within the bonfire. 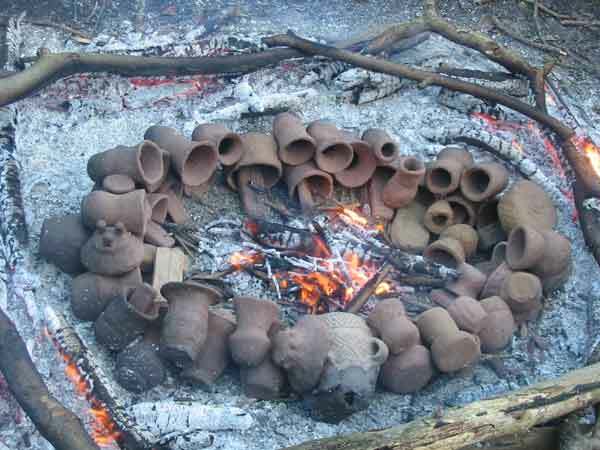 The long sticks formed a roof to protect the pots from mechanical damage and to act like a simple kiln - they burnt underneath to start with which directed the heat downwards, without wasting too much straight into the air. 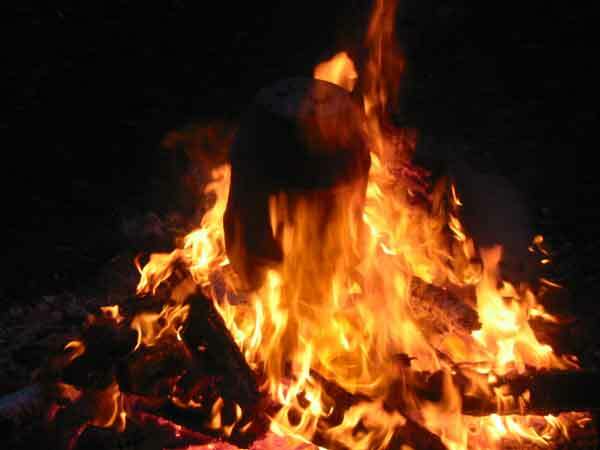 The pyre stacked up high, the flames starting to get a hold. Going for the burn - the wood flares up - taking the temperature of the pottery up to about 850 C.
For about half an hour there is a pleasantly warm spectacle to watch, as the pots begin to glow red within the fire. 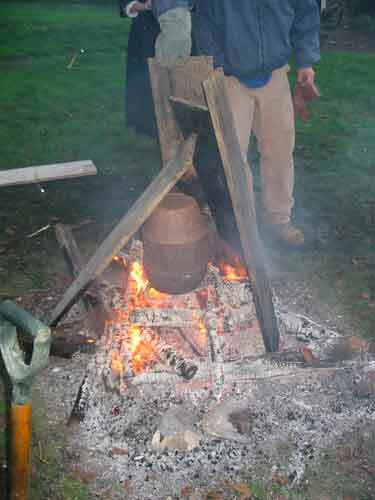 Meanwhile Bill tries a quicker way of firing a larger urn. 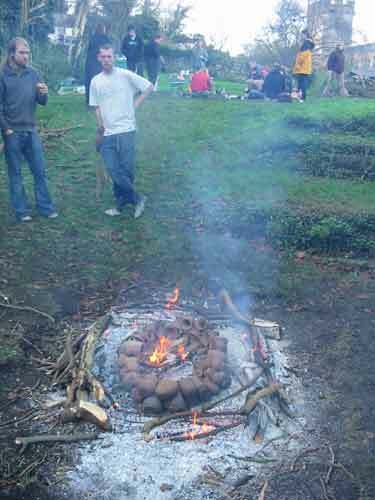 Made at Durrington Walls in September 2006, it is a piece of Grooved Ware. 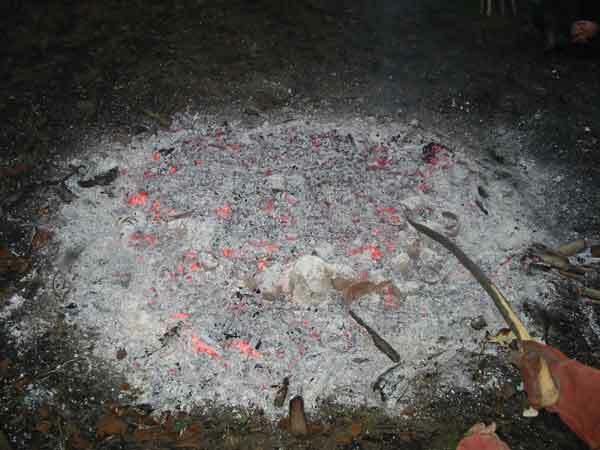 It has been dried out (including a brief spell in an electric kiln the night before) and has been stood on a metal stand over the cooking fire to warm it up. 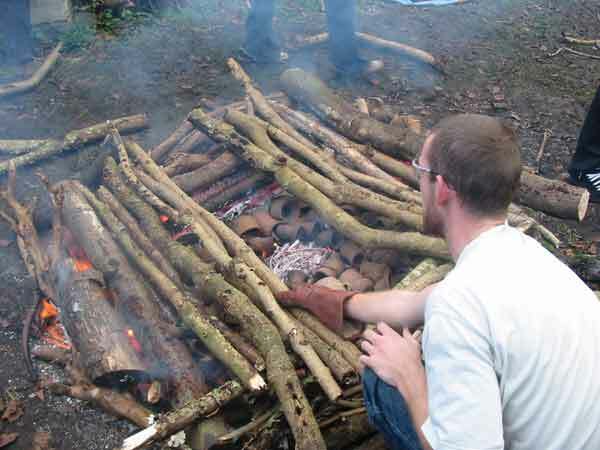 Then planks of wood were stacked around it to form a simple enclosure, holding the heat in as the wood burnt. 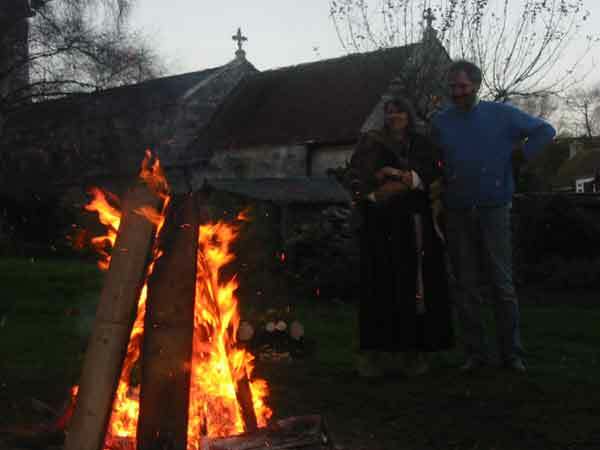 Bill and Kate take a breather, watching the pagan ritual with St.Laurence in the background! After the planks had burnt and fallen away, the pot was revealed - still in one piece, but with a couple of small cracks running up it. 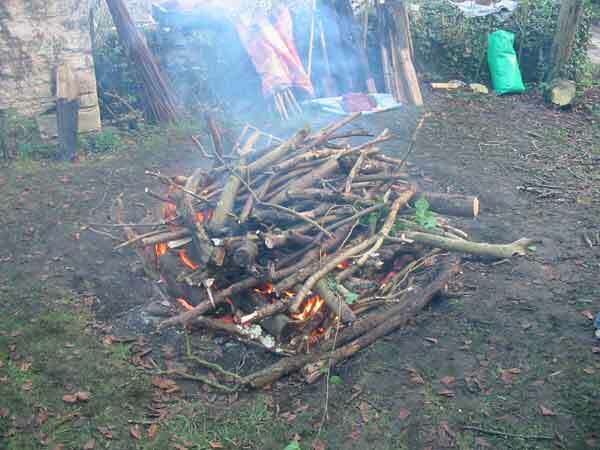 After a bit of re-arrangement the fire flared up again, trying to bake it through. Sadly after it had cooled, the pot fell apart when lifted up, the cracks were worst than they appeared and the pot was not baked through, with a dark core showing on the broken sections. Another one for the grog bucket! 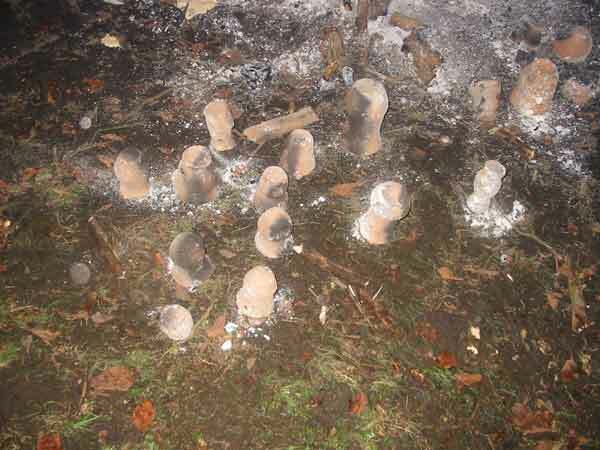 The main fire was raked out and the pots pulled up with sticks. They sat around cooling down, until they could be handled and inspected. Stacked up for comparison - no prizes, but some good trophies to take home as a reminder of degree level mud pie making! There were very few breakages, a couple of spalled bases, no cracking of rims. Some carbon smudging, but that adds a visual enhancement. The smaller sizes help to avoid cracks caused by temperature differentials (uneven heating or cooling).